Martin Audio LE2100S 2 x12" 3-way Bi-Amp High Power Differential Dispersion Stage Monitor, 3200W LF/1000W MF+HF Power, 56Hz-18kHz Frequency, 4x NL4 Connectors The Martin Audio LE2100S is a very high performance monitor designed for large-stage applications where maximum SPL's are required. It features twin, high-specification 12" (304.8mm) low frequency drivers, a unique 6.5" (165.1mm) midrange device and a 1" (25.4mm) exit compression driver mounted on a differential dispersion horn. Differential dispersion technology increases the area over which a constant SPL and consistent frequency response is maintained at ear height, enabling the artist to move around more freely. The LE2100S is best used with the DX1.5 controller to provide crossover, limiting and EQ functions. When powerful low frequency reproduction is required, the TX2181 delivers. Ideal as the companion sub to the TX2152 in a two subs to one top ratio, w/the EV DC-One handling crossover & processing duties, the TX2181 makes excellent use of its dual EVS18S woofers to provide all the low end necessary for a truly high-end professional rig. In addition, the TX2181 works as an outstanding addition to a variety of other EV loudspeaker products. w/incredibly high sensitivity & excellent power handling the TX2181 doesn't require an enormous, expensive amplifier to generate high SPL. The aesthetically unique Backbone grille not only looks great, but also provides greater strength & damage resistance than simple grille block designs. Proprietary ergonomically correct handles & angled input panels make the TX2181 easy to transport & employ in a variety of applications. The ElectroVoice TX1152 fits the bill when the low frequency extension of a 15-inch woofer is required, along with outstanding pattern control from the rotate-able, larger 60 x 40 degree horn. Utilizing the incredibly low distortion SMX2150 15-inch woofer, the TX1152 boasts specs normally associated with loudspeakers priced well over twice as much. The aesthetically unique Backbone grille not only looks great, but also provides greater strength and damage resistance than simple grille block designs. Proprietary ergonomically correct handles and angled input panels, integrated pole mount and (6) 3/8-inch threaded suspension inserts make the TX1152 easy to transport and employ in a variety of applications. EV TX1181 Tour X 18-inch Direct Radiator Subwoofer The TX1181 is the perfect companion sub to the TX1122 and TX1152 when compact and portable performance is required. Utilizing the proven EVS18S woofer, the TX1181 effortlessly provides the low frequency energy needed to keep up with Tour X top boxes, as well as many other EV loudspeaker products. The integrated low-pass input filter allows for single amp drive, and the high sensitivity and excellent power handling don't require an enormous, expensive amplifier to generate high SPL. The aesthetically unique Backbone grille not only looks great, but also provides greater strength and damage resistance than simple grille block designs. Proprietary ergonomically correct handles and angled input panels, and integrated screw-in style pole mount make the TX1181 easy to transport and employ in a variety of applications. EV ZX1I-90W Electro-voice ZX1I-90W 200 watt 8" two-way weatherized speaker system with EV DH2005 hi-frequency compression driver. 90x50 coverage pattern with rotatable waveguide. Includes QuickSAM mount bracket and 4 pole phoenix connector. White high impact polymer cabinet. 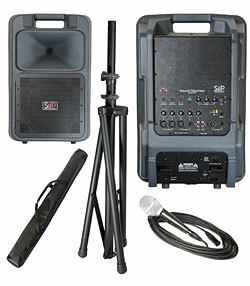 SPEAKER SYSTEMS - Zx Series: Lightweight, Advanced Loudspeaker Systems for Portable or Fixed Installation.